EU regulation has had a substantial impact on the UK financial sector, dictating the way that financial firms conduct themselves, the products they can sell, and the standards they are expected to meet. The EU’s role in setting such rules has grown exponentially over the last few years and is set to increase even further. While the EU has provided some benefits for some UK firms, a number of problems have begun to arise. These include the growing burden of EU regulation, the restrictions imposed on an increasingly outward-facing City of London, and the threat of the UK being constantly out-voted on relevant issues. Were Britain to leave the EU, European companies and organisations would still come to the City of London to get the best financing options and terms. Centres such as Frankfurt, Paris and Amsterdam have attempted to build markets that compete with the City in the past and have failed; Britain departing the EU would not make those less-competitive centres any more effective. Threats to the effect that the UK would lose access to EU customers fail to recognise the global reality of how both EU and non-EU companies (and other organisations) finance themselves. Claims that Britain would lose its ability to set up local branch offices for sale of financial products (such as insurance) within individual EU countries fail to recognise that in key respects, the Single Market in financial services is not yet started and may never be completed – and in any event UK companies are nonetheless finding way to set up local EU subsidiaries without financial passporting – again, this will not necessarily change if Britain were to leave the EU – we would be just like US or other companies that are outside the EU now, but which are managing to find ways to have local subsidiaries. The UK financial sector is deeply interconnected with the EU’s financial and capital markets, currently enjoying – as one of the four fundamental freedoms of the EU – complete free movement of capital. However, because many of these rights appear, at least on paper, to be dependent on EU membership, leaving the EU raises questions about the extent to which access to the EU’s capital markets would be compromised, and whether the rights that UK financial firms currently enjoy would expire. While some rights may disappear without the UK first securing a ‘special deal’, there is little doubt that Britain’s financial services sector would continue to enjoy comprehensive access to the EU’s capital markets regardless. Some pro-EU groups, such as the Centre for European Reform, have argued that, if Britain left the EU, some banks would leave and the UK would end up with “more limited access to European markets than it currently enjoys”. However, it is very unlikely that the EU would try to deny the City access to European capital markets: the EU itself would be harmed if it cut ties with the City of London. Further, the appeal to large multinational financial institutions of settling in the City is not simply Britain’s EU membership. The UK has a range of attractions to these firms. However, even if the EU refused to engage with the UK in this, the UK could still continue to have access to EU capital markets anyway. Access to EU capital markets is not dependent on EU membership or even on a ‘special relationship’; a commitment to allowing access to capital markets is enshrined in the WTO’s General Agreement on Trade and Services (GATS). But while the EU does permit access to its capital markets from third parties, there is a cost: for certain transactions, the European Securities and Markets Authority (ESMA) must deem the third country’s financial system as ‘equivalent’. ‘Equivalence’ could be retained by the UK deciding to replicate EU financial laws as they are produced. Considering the sheer lack of UK influence over EU laws this would not be materially different to the situation we find ourselves in today. In fact, by reclaiming a seat at key international [financial] institutions, the UK may gain a more significant role in drafting the international rules that the EU then transcribes into its own laws. There are other reasons to be optimistic about the likelihood of the UK retaining access to EU capital markets if it leaves. Given London’s enormous financial market, Britain would have a great deal of clout in any negotiations. In addition, given that it has been a member of the EU for so long, it is extremely likely that ESMA would, initially at least, determine that the UK complies with European law and thus deem its financial regulatory system to be ‘equivalent’. Leaving the EU need not compromise regulatory standards or lead to a ‘race to the bottom’. The UK could – if it wished – mimic EU standards, retaining much the same position it has now. It could also continue to engage with the EU to discuss how to share and develop best practice. UK-based financial firms would certainly continue to lobby Brussels and Strasbourg in any case. As noted previously, if the UK wanted to retain full access to EU capital markets, it would have to emulate several of the EU’s financial policies to ensure its regulatory system is considered ‘equivalent’. Absolute equity will not necessarily be required, however. It is not even a condition for EU membership; divergence is already taking place. In March 2014, the EU reached an agreement on Banking Union – however, the UK chose to remain outside it, with no question about this compromising its terms of membership. Meanwhile, leaving the EU would offer the UK a chance to develop new rules to cater for its financial industry. Parliament would have the power to make the UK even more welcoming to foreign firms and a far better place to do business. Today, the EU has a substantial remit over financial firms and the wider financial markets. However, the UK’s influence over financial laws has declined dramatically since the 2008 financial crisis. The European Commission has made it clear that it is moving away from traditional UK views on financial regulation. The UK lacks the constitutional power to block harmful rules because the vast majority of EU financial law is based on the Treaties’ Single Market articles, which means that the laws are decided via Qualified Majority Voting (QMV) in the Council of Ministers. So the UK lacks a veto over financial laws. By contrast, France has a veto over any changes to the Common Agricultural Policy, allowing it to protect its premier industry: agriculture. UK influence within the EU’s institutions has declined dramatically. In 1979, the UK had 20 per cent of the seats in the European Parliament. By 2015, that had declined to 9.5 per cent. 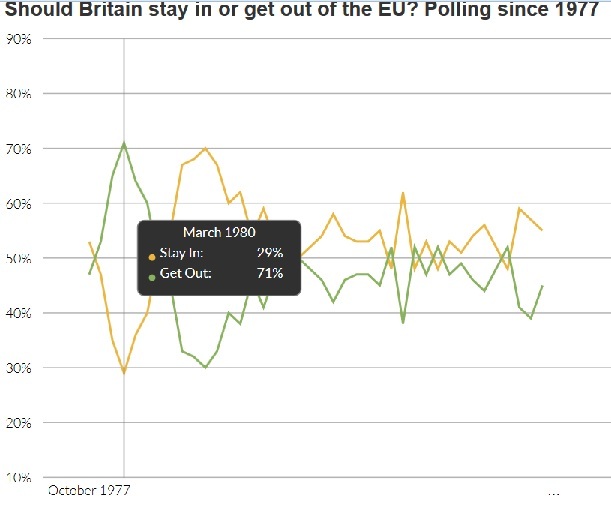 Likewise, while the UK had 17 per cent of the votes in the Council of Ministers in 1973, that has declined to at least 12 per cent. In 2012, George Osborne was able to secure a ‘double majority lock’ in the European Banking Authority, which forced laws passing through that institution to go through two rounds of voting: Eurozone states and non-Eurozone states. This allows a majority of non-Eurozone countries to effectively vote down laws that would harm their interests. But it has subsequently emerged that – were the number of non-Eurozone states to fall to four or lower – the ‘double majority lock’ would expire. Considering the likelihood of the number of non-Eurozone states falling to four or fewer in the coming few years, the life expectancy of the double majority lock seems short. If the UK leaves the EU, the most important change that would take place is that the British Government would once again be put in charge of financial regulation. The scope for action may be limited if the UK decides that its priorities are to ensure unfettered access to the Single Market. It is clear, however, that the UK would be able to opt out of the EU’s ‘mission creep’ in financial services – a power it doesn’t have today. There would be costs, but it would be a decision that the UK would be able to make by itself. Were it to leave the EU, the UK would immediately gain the power to re-evaluate existing laws and to determine how to incorporate future EU financial laws. This offers the attractive prospect of the UK being able to introduce its own consultation mechanisms, able to better mitigate the harmful impact of future EU rules. ESMA does not demand complete uniformity of financial laws for a third country to be deemed ‘equivalent’. So even if the UK were to decide to incorporate EU laws, it would still have the power to make changes to them. Exiting the EU does not mean losing access to the EU’s capital markets, or sacrificing the principle of free movement of capital. Immediately after leaving the EU, the UK would retain all of the EU directives and regulations that it has already signed up to – by definition, the UK’s regulatory system would then be considered equivalent to the EU’s. UK policy-makers should have little difficulty in engaging with EU counterparts about how to ensure that our two financial systems are ‘equivalent’ as time goes on and new policies are introduced. However, the UK would now have much greater say over the detail of its ‘equivalent’ legislation, and could work towards discarding provisions like the Alternative Investment Fund Managers Directive. In the late 1990s, pro-EU organisations claimed that the UK’s financial sector would decline if Britain failed to join the euro. They were wrong then, and they are wrong now to suggest that the UK financial sector would not cope outside the EU. With the right policies there is no reason the UK cannot still trade with the EU while better developing links with countries globally. So long as access to the EU’s capital markets continues, there need not be any reason for financial firms to move their headquarters. The UK lacks influence within the EU already. Having a seat at the table has not allowed the UK to effectively challenge any of the EU’s new financial rules. Britain and its financial services industry have nothing to fear from separating from the EU’s institutions. Extracted from Change, or go, published by Business for Britain. The editorial board: Jon Moynihan (Chairman); Andrew Allum of LEK Consulting; Matthew Elliott of Business for Britain; Luke Johnson Risk Capital Partners; Mark Littlewood of the Institute of Economic Affairs; John Mills of JML Ltd; Helena Morrissey of Newton; and Viscount Ridley. Telegraph Media Group helped fund the study.